Dr. Laura Baltodano graduated in 2013 from Washington State University. She is the owner of Lighthouse Pet Clinic in Lehigh Acres, Florida. In addition to veterinary medicine, Dr. Laura is passionate about equipping others with tools to enhance their wellbeing. She is a certified health and wellness coach, a certified 7 Minute Life Time Management Trainer, registered yoga teacher and, mindfulness teacher and is licensed to teach The Four Elements of Success by Lori Beth Jones. Her app, “The Wellness Doctor,” is available for download from the App Store or Google Play. Your day may go something like this. Grab a cup of coffee as you rush out the door to the clinic; if you have a minute, gobble down a bagel or donut—whatever is within reach. You arrive at the clinic, going nonstop, all day, rushing from appointment to appointment with patients or to surgery. Lunch? What’s that? Take a quick break before afternoon appointments start up. Finally, the day is done and you’re heading home exhausted, so you just grab takeout or drive through the fast food lane because you don’t feel like cooking and—hey!—you deserve it. Getting home, you collapse in your favorite chair and fall asleep halfway through a TV show, only to start the routine all over again the next day. Does any of this resonate with you on any given day? Maybe this sounds a bit extreme to some, but for others that is “real life.” As you are likely spinning your wheels daily, it is imperative to get the proper nutrition in order to sustain your health. With a little bit of pre-planning, it is possible to have some grab-and-go items readily available to you on the days when life gets too busy. 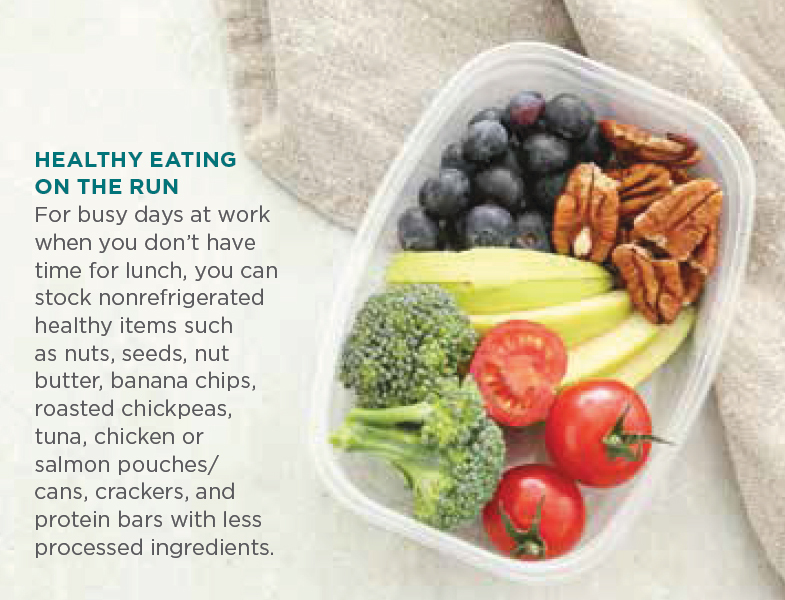 For busy days at work when you don’t have time for lunch, you can stock nonrefrigerated healthy items such as nuts, seeds, nut butter, banana chips, roasted chickpeas, tuna, chicken or salmon pouches/cans, crackers, and protein bars with less processed ingredients. If you have a refrigerator available, hard-boiled eggs, yogurt, fruit, veggies, guacamole, cheese, and some select pre-packaged foods (just watch for the sodium content and ingredients on these). If you are able to prep some food for the week by making some core items ahead of time, it can really help on those busy days when you don’t want to cook. Some staple items include a protein such as chicken, brown rice, quinoa or sweet potatoes. Frozen, individual fish packets thawed in the refrigerator before you leave for work are good for a quick meal with cauliflower rice. Pre-slice veggies to toss a quick salad together or some pre-steamed veggies make for an easy, quick and well-rounded meal. If you have a family or are cooking for several people, crockpot meals can be a lifesaver! The Instant Pot is a really handy kitchen tool to make meals in a hurry using the pressure cooker setting, or you can have it cook throughout the day using the slow cooker setting. You can always make extra and bring leftovers to work the next day. Score! Another nice option is scheduling a food service to deliver ready-to-cook meals a couple times a week to mix things up. These meal options bring all the ingredients for a recipe and can usually go from stove to table in under 30 minutes. Having a plan and some staples can make all the difference in getting in a healthy meal even when you are tired or unexpected circumstances come up. The key is setting an intention to eat healthy and know that it does not need to be fancy. Despite having busy and, at times, hectic schedules as professionals, eating healthy is still possible.